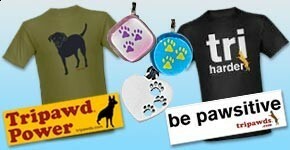 We just made it much easier to find your favorite three legged dog t-shirts and gifts in the Tripawds Gift Shop. Start by visiting the BROWSE page here in the Gifts blog. 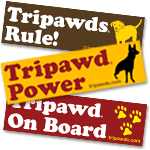 With all items in our gift shop categorized by design, we created the new page here so you can browse all Tripawds designs at a glance. Click on the thumbnail of your favorite ones to see all products available with that image in the gift shop. 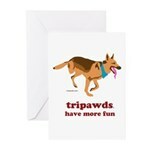 Most Tripawds designs are available on many different styles of t-shirts and apparel, caps, mugs, stickers cards and many more gifts for the home or office. 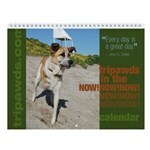 When shopping for your favorite gifts, you will also notice a Browse All Designs link on every page of the Tripawds Gift Shop. That will return you to the BROWSE page of this blog where you can see all the designs currently available. We will update the page with new designs whenever we create them. More coming soon, no really!